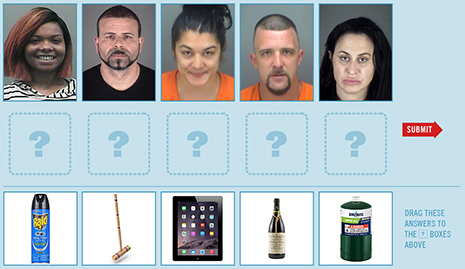 APRIL 5--For today’s “Friday Photo Fun” game, readers must examine five mug shots and match up the defendants with the respective weapons they allegedly wielded during assaults or batteries (Raid Flying Insect spray, croquet mallet, iPad, bottle of wine, propane cylinder). 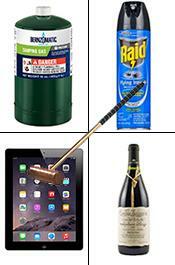 You can play today’s contest by clicking below. You’ll also find it as the latest post on our “Time Waster” page, where you can test your sleuthing skills by playing over 450+ archived match games. Good luck, and thanks for playing.